With the evolution of so many incredible mirror shapes, styles and sizes, the age-old looking glass has become much more than a trusty companion to help you get ready in the morning. Mirrors have earned status as an effective interior design tool used to fulfil practical purposes and a multitude of creative motives. 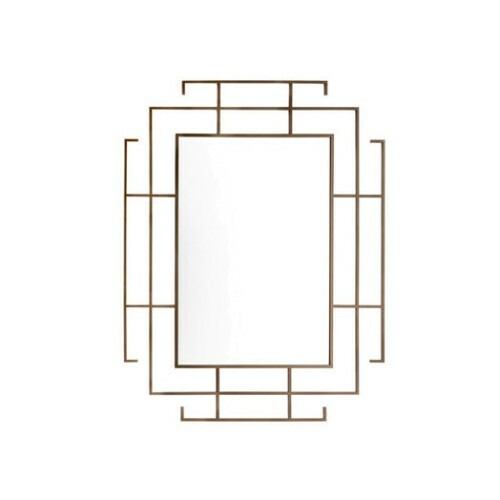 Whether you want to add a polished touch to your interiors, make a statement with wall art or amplify light and space, a thoughtfully chosen, well-positioned mirror is the answer. Discover our favourite ways to style with the reflective accessories in our round-up of looks using mirrors to their maximum potential. 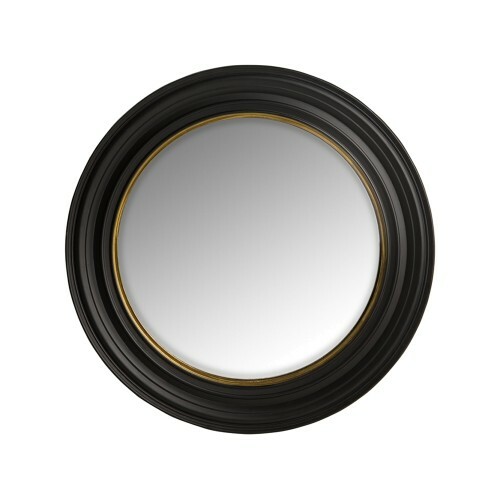 A statement mirror is a great way to create a sense of artistry on your wall. 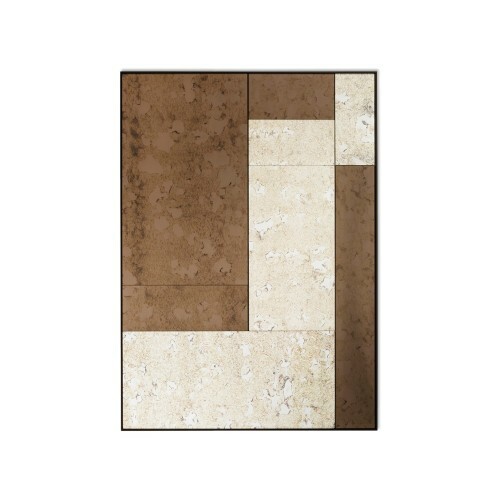 Designs supercharged with oversized proportions and personality serve as a focal point and are perfect for adding interest to transition areas of your home, such as hallways and corridors. In this Chelsea house by Helen Green Design note the way the sunburst mirror is artfully positioned above the hallway console table but also cleverly between the doors of the room it faces. 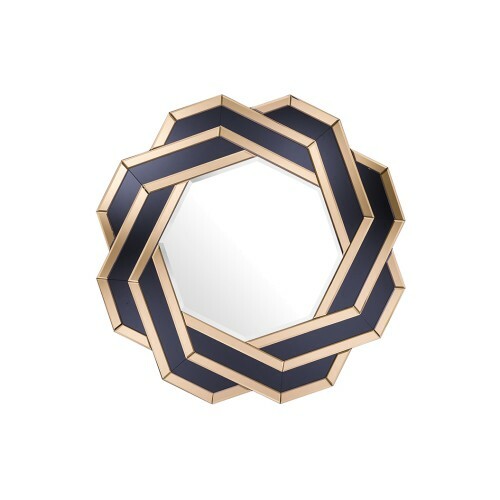 Geometric mirrors promise high impact and usually offer a contemporary aesthetic, although certain silhouettes are synonymous with the Art Deco era. 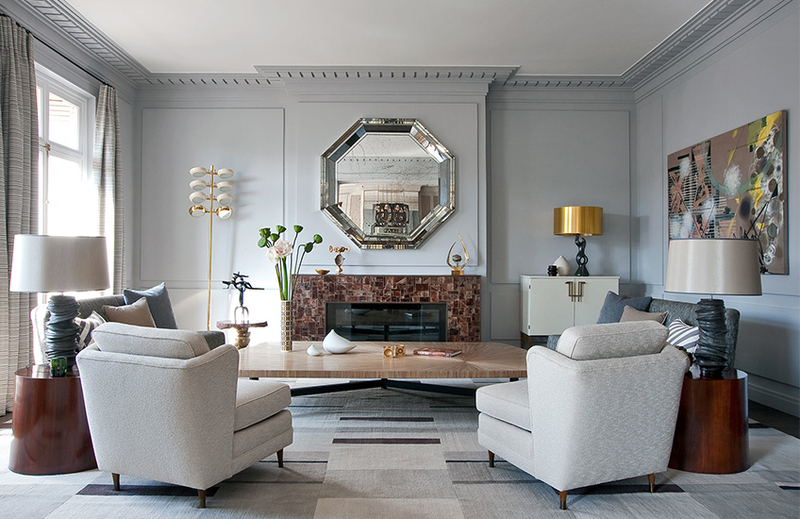 Jean-Louis Deniot takes advantage of the empty space above the fireplace in this Parisian residence with a silver octagonal design. Despite being surrounded by exquisite furniture and lighting solutions, the mirror doesn’t have to try hard to steal attention thanks to its captivating sheen and perfect placement. 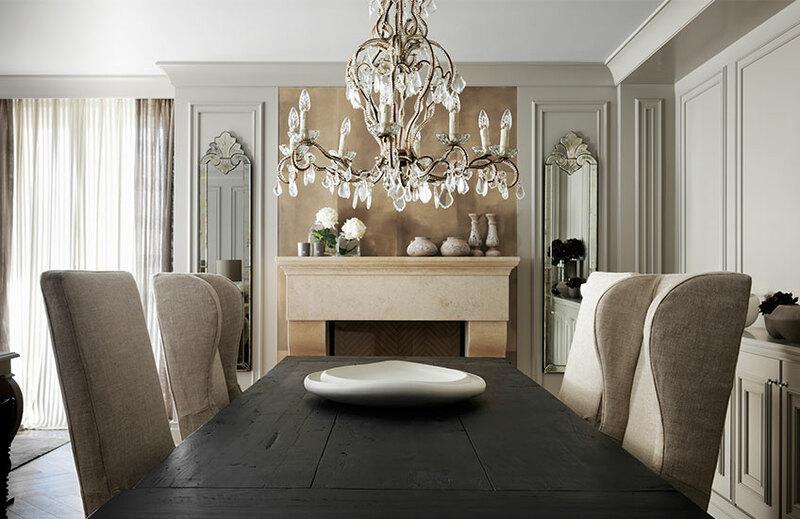 This tasteful dining room, taken from a luxurious Switzerland chalet designed by Kelly Hoppen, opts for two decorative mirrors. The slender profiles complement the wall mouldings while their shapely tops adds interest to Hoppen’s signature pared-back palette. Take inspiration from the positioning of the mirrors at either side of the fireplace as opposed to above it, which enables the rustic accents, flowers and decorative chandelier to fully take centre stage. This super-cool living space by Pierre Yovanovitch reveals the potential for subtle mirrored touches to make a significant influence on the style of room. 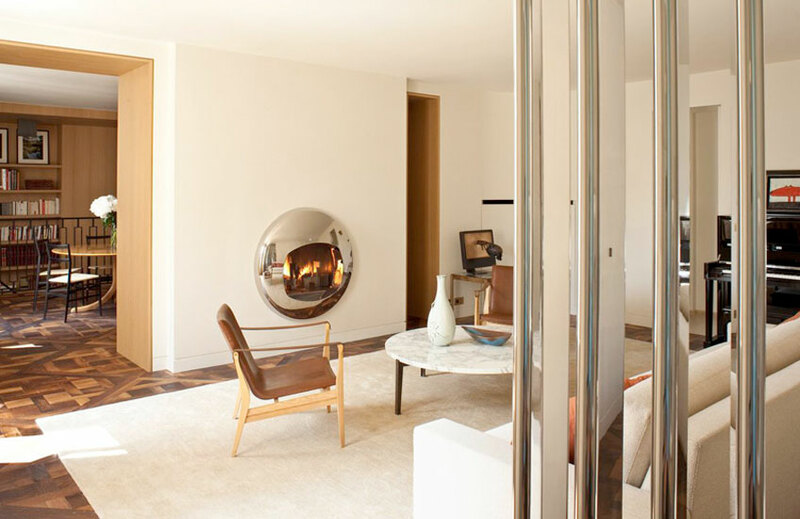 The made-to-measure mirrored fireplace, which was designed by the French designer himself, has a fishbowl effect and intensifies the room’s retro look alongside the Mid-century furniture designs. Columns crafted from the same bright polished metal as the fireplace by Parisian metalworkers add cohesion to the space. Kelly Wearstler is the orchestrator behind the show-stopping redecoration of this room from a 10,000-square-foot Georgian residence. 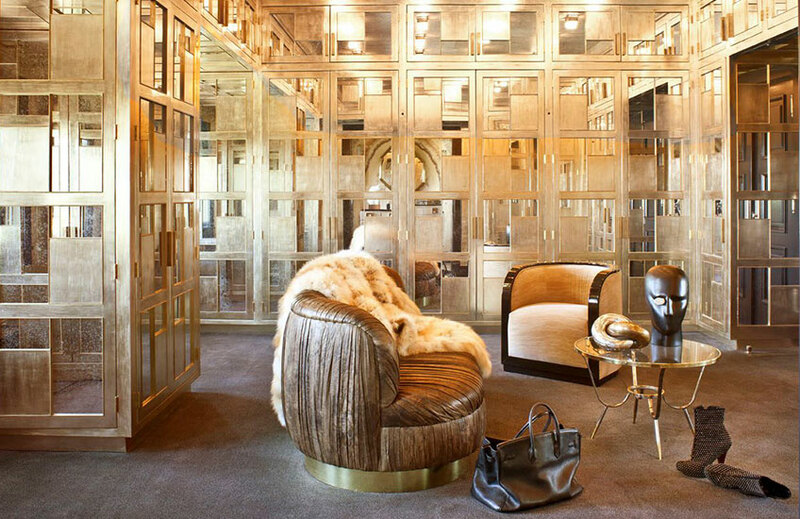 A maximalist through and through, Wearstler isn’t shy to go all out in this living space and takes the installation of mirrored surfaces to new limits. Individual reflective surfaces add up to a mosaic effect, working their way from floor to ceiling to boost height and light. 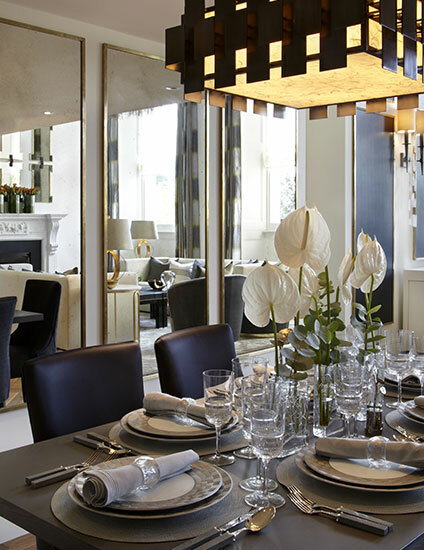 This beautifully designed dining room is the work of Katharine Pooley and plays with a repeated mirror display. The trio of identical full-length designs are testament to the fact that there’s something so aesthetically satisfying about objects placed in threes, as they transform vacant wall space into an unmissable room feature. Placed tightly together one after the other to reveal little of the neutral wall colour, the presence of the large mirrors maximises the sense of space to great effect. Their frames remain slender and golden, tying in with the sophisticated colour scheme whilst taking a backseat to allow the reflective glass to work its magic on the space. Laura Hammett uses a series of mirrors in this interior and the result speaks for itself. 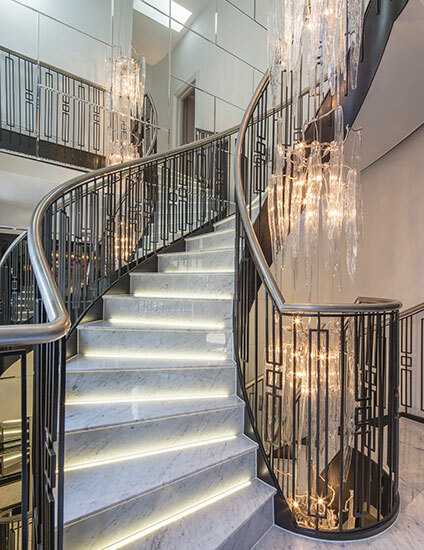 A mirrored wall is deliberately teamed with a sheeny marble staircase, metallic handrail and transparent lighting feature – complete with crystal shards – to create the ultimate light-infused space. The reflective panelling also creates a seamless flow from room to room, enabling a clear view of the beautiful interior design upstairs and downstairs with one simple glance at the mirrored wall. This dressing room shot is a telling demonstration of mirrors’ ability to enhance the feeling of light and space in smaller, awkward-shaped rooms with limited light. The narrow dimensions and curved ceiling of this dressing room are optimised not only by a neutral colour palette and carefully considered lighting but also by wide, sliding mirrored doors. The reflective wardrobe plays with the room’s arched shoe cabinet, creating the illusion that it is double its true size. 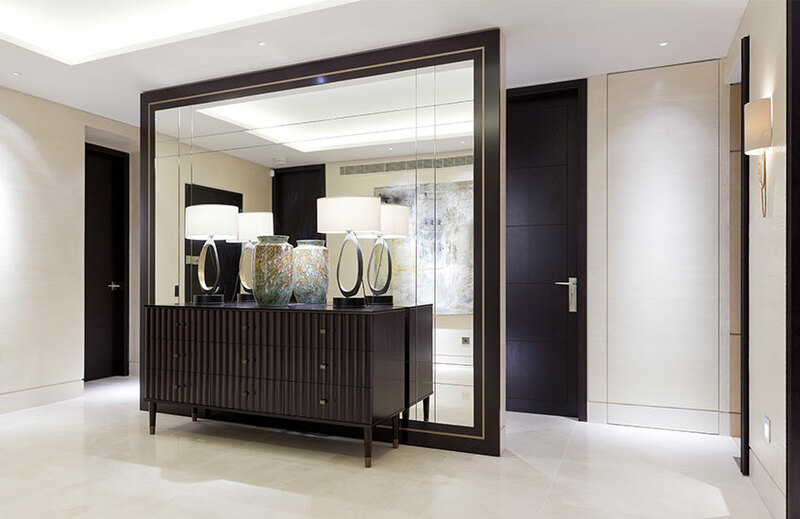 It’s evident that London design firm Taylor Howes fully appreciates the immeasurable benefits of mirrors by its use of this grand reflective surface as a central feature in this Knightsbridge hallway. Characterised by dark woodwork and furniture, the mirrored room divider brings illumination to the space. Its presence behind the sideboard reflects the image of beautiful table lamps and vases, and shows off the canvas on the opposite wall. Steal design cues from this room setting and use a mirror to show off your the latest artwork investment. 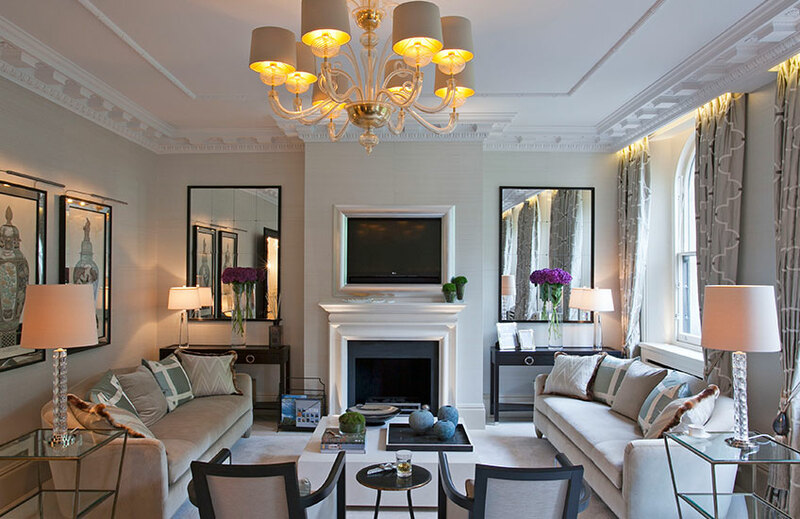 A pair of generously sized walls mirrors are used to create a symmetrical display in this Hyde Park residence. The classic contemporary living room achieves almost a perfect mirror image by combining identical furniture designs with harmonising cushions, table lamps and artwork. The addition of two matching mirrors adds to this balanced beauty and gives the space a feng shui spirit. Working a simple, traditionally square silhouette, the wall mirror in this image brings class to the impressive living setting. The looking glass fails to go unnoticed thanks to its proportions, which are almost as wide as the sofa, and brings another dimension to the neutral wallpaper by reflecting the bold green canvas at the opposite end of the room. See the way it’s also positioned to show off the striking chandelier. The advantages of reflective surfaces aren’t necessarily always delivered by mirrors alone. If your wall is occupied with ornate wallpaper, wall lights or artwork, mirrored furniture is an alternative way to reap the benefits of mirrors. 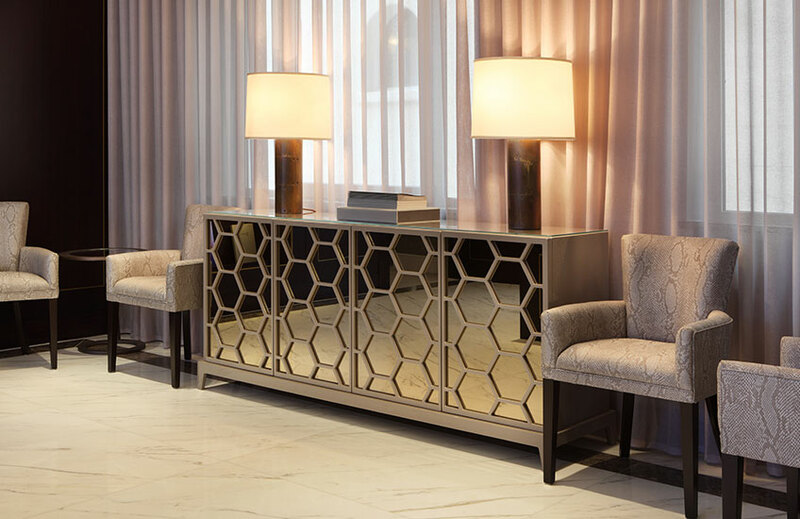 This sideboard – fronted with mirrored glass and geometric detailing – creates the illusion of an extending marble floor and is a perfect example of the flattering effects of mirrored casegoods.